It’s not without justification that the Bible says that God gave Noah and his family the rainbow at the end of the Flood as a sign of Hope. Aside from the biblical references, multiple societies refer to the metaphor of rainbows (hope) following storms (difficult times). This one was from a few days ago when LA got it’s first decent rain in a long time, which helped put out those fires. (And brought mud slides and flooding to the burn areas, but let’s not get too nit-picky here.) Tomorrow and Thursday we’ll get more rain and perhaps more rainbows. I fear that the worst “storms” might be ahead of us in any number of dimensions, so I’ll start stocking up on rainbows now. I think we’re going to need them. 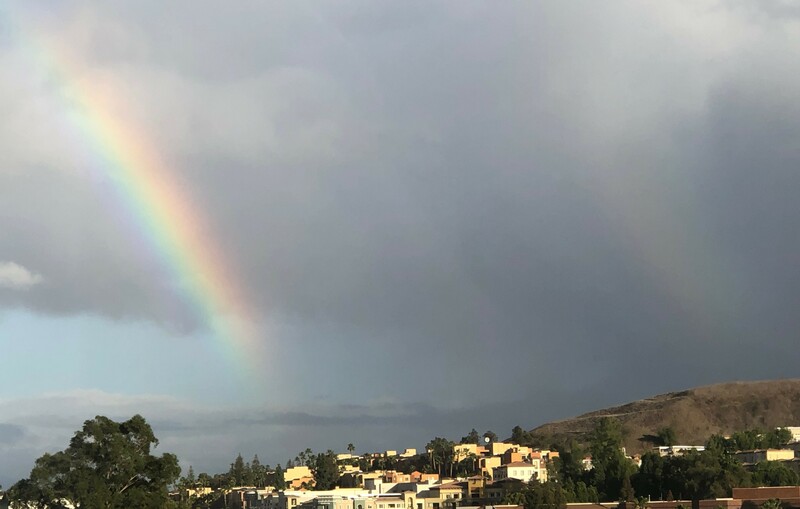 When the storms hit, whether they be in our personal lives, the lives of those near and dear to us, in our state, country, or across the whole world, let’s remember that there are going to be rainbows if we can just hold on to see them. Someday we will find it, the rainbow connection…..